After a third failed attempt at getting pregnant in her late thirties with in-vitro fertilization, Jodi, a pediatric mental health counselor from Chicago, asked her doctor to be straight with her: “Does my weight have anything to do with this?” At 5 feet 5 inches, Jodi weighed close to 300 pounds. Although studies show that excessive body weight can disrupt obese women’s hormone balance and make it harder for them to ovulate, Jodi’s doctor reassured her that wasn’t her problem. However, he did deliver this sobering news: her weight might make it harder to have a healthy pregnancy and healthy baby. The latest news about the negative effects of our nation’s obesity epidemic on everything from fertility to pregnancy and maternal mortality recently prompted the American College of Obstetricians and Gynecologists (ACOG) to urge doctors to talk with patients about the benefits of slimming down before trying to conceive. It’s part of an ongoing push to make chats about women’s “reproductive lifespan” as routine as an annual pap smear. Just as doctors have historically shied away from telling women that their eggs are getting too old, many haven’t been eager to point out that a woman’s size might come in between her and her dream of becoming a mother. For Jodi, who has been on “hundreds of diets” and struggled with her weight since she was eight years old—topping out at 425 pounds in her early thirties—the pressure to shed pounds felt overwhelming. “I had to worry that I’m not just hurting me when I’m bingeing, but I could be hurting someone else,” she says. Jodi declined to give her full name. Of course, doctors point out that the majority of the estimated 30% of obese women in the U.S. have no problems conceiving. But there’s a growing body of evidence that’s difficult to ignore. 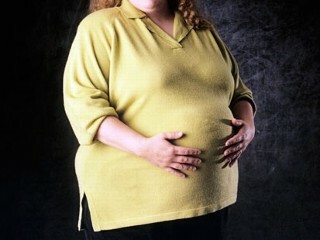 Obesity raises a woman’s risk of gestational diabetes, hypertension, premature delivery, miscarriage, and stillbirth. A mother’s chance of having to undergo a caesarian section is 34% if her BMI is over 30, and 47% if her BMI is over 35—compared to 21% for women with a BMI under 30, according to one study. There’s even evidence that babies born to obese women have a greater chance of suffering neural defects than those whose mothers are normal weight, and will be at greater risk of being obese themselves. In one recent survey of more than 3,300 women, one-third responded they didn’t believe or were unsure whether a woman’s weight affected her chances of conceiving. The doctors’ organization hopes that encouraging ob-gyns to broach the topic will educate women about that connection, considering that about 6% of infertility is due to obesity (another 6% is due to being too thin), according to statistics by the American Society for Reproductive Medicine. (That goes for men, too, since a recent French studyshowed their excess poundage contributed to low sperm production.) The good news is that 70% of these women will get pregnant naturally after they lose or gain enough weight to get closer to a healthier BMI. Now 45, with few viable eggs left, Jodi is trying to get pregnant again using donor eggs fertilized with her husband’s sperm. Since her last attempt, she has lost and regained 40 pounds. Last fall, she enrolled in Insight’s program on managing eating disorders. They also offer sessions about coping with the emotional challenges of infertility. ***This article is written by Sarah Elizabeth Richards for Time.com.